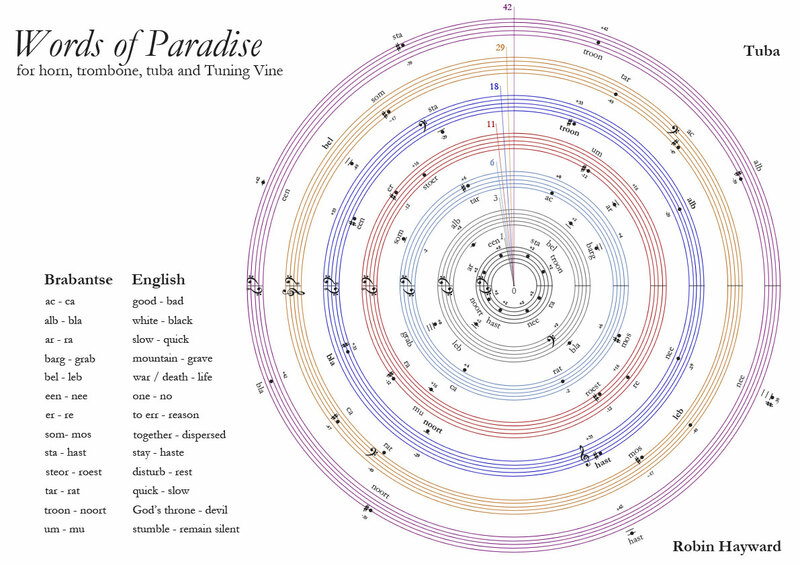 Words of Paradise was inspired by the ideas of the Renaissance Dutch linguist Jan van Gorp (1519 - 1572), who thought he had shown the Flemish dialect Brabantic to be the original language spoken in Paradise. Observing Brabantic to have a higher proportion of single-syllable words compared to other languages, Becanus reasoned that as the first language must also have been the simplest, all languages must ultimately be derived from it. He also drew on the idea that reversing a word’s sound reversed its semantic meaning. The composition draws on the sound of 13 such single-syllable reversible words that Becanus used to support his theories, using hocketing techniques to combine them into longer ‘words’. The colour-coding in the circular graphic score follows that of the Hayward Tuning Vine, which is also played in order to provide a harmonic reference, allowing the musicians to make immediate decisions in their own time. In a metaphor for leaving paradise, the harmony gradually drifts away from unison to the complex harmonic and subharmonic relationships of the outermost circles.